TREES asso shows us how to create a brake system with a rope and a pulley! Simple, fast and very useful ! Romain Schempf answers to our questions about the leash and the rings in order to understand better the consequences of a leash fall. What is the strength involved in case of leash fall ? It depends on the length of the line, its tension and its composition (polyester, dyneema…). The weight of the slackliner has also an influence, as well as the length of the leash itself. If the leash is 2 meters long, in the best case the force existing in the leash will be 250kg and in the worse case i twill be 750kg. This is similar to a factor 2 on a belay. – Can we have leash fall without moderation ? We have noticed on ENSA tests that a dyneema sling will break in case of factor 1. What about webbing ? How many factor 2 can take a webbing ? No, we should be careful about leash falls. During this fall the friction between the rings and the webbing will slightly burn the webbing, which makes it weaker. On the ENSA video (bellow), the test is a bit different because the dyneema sling is 2 meters long. On a highline the webbing is longer and has a small stretch, which spread the impact over the whole webbing. The impact can be around 1T9 on a dyneema webbing at anchors level. Since we are talking about webbing (textile), it’s only a matter of time before reaching the breaking : hard to know when it will happen. Leash falls should not become a habit. – What about the leash rope itself ? Most of the companies sell them with a standard of 7 fall with a factor 2. That’s right. Beyong 7 falls, the leash will not necessary break but the stretch will be reduced so your back will suffer. It is recommended to change regulary the rope of the leash. – If the rings are all strong enough to undergo a leash fall, why should we use 2 of them ? Is it about material or only a psychological side ? It is estimated that the breaking strength should be minimum 5T, that’s why rings holding 2T5 each are double in order to reach 5T. This also prevent the risk of a flaw / failure in one of the ring. The flaw can be for example a air bell. So, double rings is a recommended back up. – Should we prefer aluminium or steel ? Aluminium is lighther but can be reform in case of collision. – Should we get rid of aluminium rings if they fall on the floor ? Yes, if they fall on a rock or something hard and bounce they should not be use again. – Steel rings are really heavy, could they be dangerous if we hit them with the head ? Yes, someone even broke his/her teeth. The solution could be to use a piece of rubber to be safer. 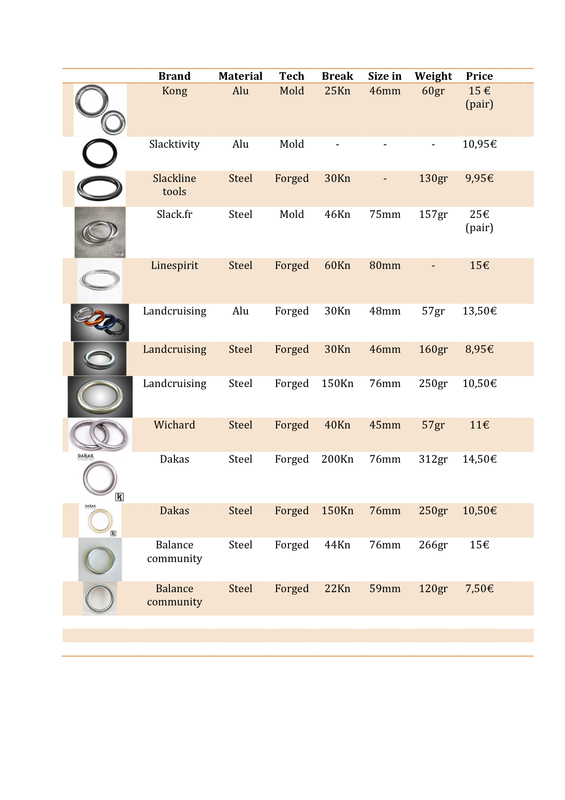 – There are different diameters of rings. Is that important or is it only a personal choice ? The advantage of big rings is that they slide better around windstoppers. It will prevent more the use of the rope. The tread is like a backup.